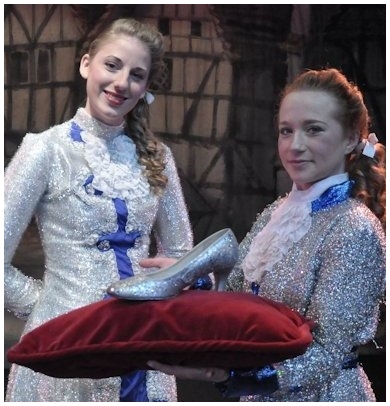 Combining the fairy-tale enchantment of Cinderella with hilarious comedy, this outstanding script has it all! Big on laughs, but true to form, this imaginative new version has won numerous awards and is, without doubt, one of the most popular panto scripts of this millennium. Many strong traditional character parts are provided, including a delightful Cinderella, a particularly endearing Buttons and outrageously funny Ugly Sisters! Yet more chaos and laughter ensues when two comic builders, Bodget and Leggett arrive to re-develop Hardship Hall, whilst Hagan the pantomime horse (optional) provides a novel twist. With loads of originality, audience participation, slapstick routines and traditional business, this superb script also allows much scope for the more ambitious company. Full cast and scenery requirements are listed below. Many productions of this script have won NODA and drama federation awards, including DE Caversmill Theatre Company (NODA “Best Pantomime”), plus Paignton Pantomime Productions and Oddity Theatre (both of whom won “Best Pantomime” out of the whole NODA South West Region)! We also offer a version of this script with a Haunted Boudoir Scene for the Ugly Sisters in place of the optional slapstick Decorating Scene, plus another "smaller cast" version without the Broker’s Men. All versions are also available without Hagan the Pantomime Horse. In addition, there is another “potted panto” (one act) version of this script for a cast of 10. For a Reading Copy of any of these alternative versions, click here and select Cinderella and specify the version you require in the message box on the order form. Where are my two little rosebuds? (Calling:) Gertrude! Grizelda! Yes, Mumsy. Here we are! Oh, Gertrude, you look a million dollars. Yeah, in used notes – all green and crinkly! And Grizelda, you look like a film star. Just ‘cos you’re jealous! (Preening her hair) What would you give for hair like mine? (Pulling Grizelda’s wig off, as if a prank) I don’t know – what did you give for it? (To Grizelda in a loud whisper) It’s okay, Sis – I don’t think anybody noticed! Stop it, you two! If you start fighting at a “do” like this, you’ll be picked up by the bouncers! (Plumping up their bosoms) Ooooh! what – there’s a room where William the Conqueror stayed. William the Conqueror? Are you sure? Well, it’s got his initials on the door! (She looks at the audience and waits for them to get the joke.) Oh, the penny’s dropped, has it? Yeah – that’s where they practise the “royal wee”, isn’t it? Followed by a royal flush! Ooh, I wonder when the dancing’s going to start. I can’t wait to do the bossa nova. I thought your party-piece was to do the boss a favour! Never mind that – you’ll soon be able to get working on the Prince. Oh, goodie! Come on, Gertrude – let’s get twerking! I said “get working” on the Prince, not get twerking! “…Alan P Frayn always offers a good script which is direct, funny and modern. The choice of this script gave you a good start. It was entertaining in itself and so was immediately a winner with the audience." "...Deeside Musical Society had the benefit of a super script and storyline. The inspired introduction of a couple of cowboy builders trying to repossess Hardship Hall gave the delightful duo a chance to knit the storyline together with comic continuity." "...The script was original and exciting to watch as the plot unfolded – a good script means a good pantomime. The jokes came thick and fast and they were new. No more "right toe" or "you're next to an idiot" type jokes, but fresh and topical!" "...Alan P Frayn’s very funny script stayed true to the traditional Cinderella storyline we all know and love. 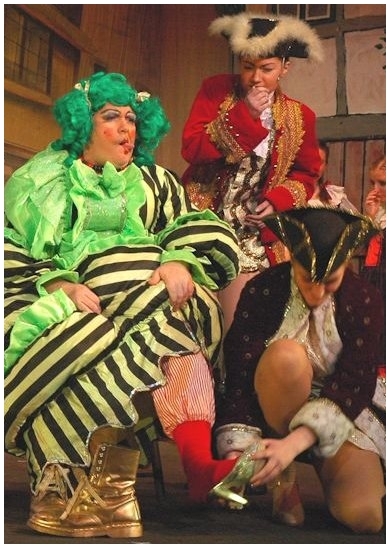 The Ugly Sisters had us rolling in the aisles, even as we deplored their wicked selfishness. Having picked out a hapless victim in the audience, Grizelda flirted with him outrageously throughout the show." "...What a treat it was - the best thing was the side-splitting humour from the Ugly Sisters - the lines were fantastic!"